The campaign in Burma has been especially effective and is seeing marked reductions in malaria deaths in the areas that the campaign is active with some villages and camps reporting reduction in deaths of over 50%! NGOs with whom we are partnering are very excited by the results. The three year funding arrangement we had for this program has run out and we are urgently trying to raise the funds to continue the campaign in 2013 and beyond. 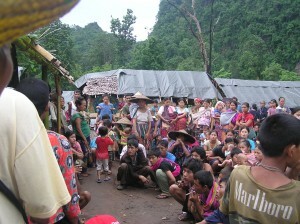 We need to raise $80,000 to help cover the costs of LLIN mosquito nets which we are distributing to internally displaced people inside Burma.The families who receive these nets are living in one of the most dangerous malaria areas in the world where the parasites are becoming resistant to malaria medications and mosquito nets are really the first line of defense against malaria infections. Your tax deductible donation can help us to continue the vital work of Buzz Off is doing in vulnerable communities in the remote areas of Burma. We cost each LLIN net at $10 per net. Donations for nets can be made here at the Australian Mercy secure site. Just select Buzz Off Nets from the target menu.